SDL500 Setting up Communication - NexSens Technology Inc.
iChart Software is used to communicate with the SDL500. Follow the Setup Device Wizard or Installing and registering iChart to install the software. To set up communication, follow the appropriate telemetry steps to establish a connection between the data logger and computer. To establish a direct communication with a computer, first connect the data logger using the SDL500 USB interface cable. One end will be connected to the iChart computer via USB, while the other will connect to the topside port of the SDL500. To establish cellular communication with a computer, first connect the A49-SDL antenna to the top communication port. Also, power the SDL500 with internal batteries, solar power pack(s), or with an external 12 VDC source. A radio base station must be used to establish communication between an SDL500R and a computer. To set up the base station, simply install an A44 radio antenna to a 4100-BASE base station using an RF cable. Mount the antenna in a location to maximize signal strength. Next attach the supplied PC cable from the MS4 connector on the base station enclosure to the PC. Connect the 12 volt power adapter from the male power jack on the PC cable to an available wall outlet. Following the physical setup, open iChart and select Advanced | iSIC | iSIC. The iSIC Setup window will be displayed. 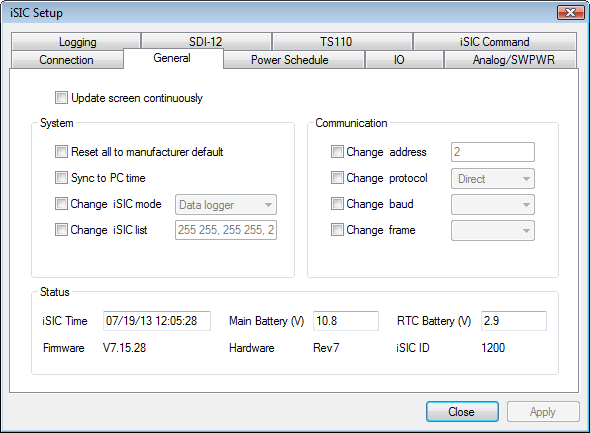 Choose the communication (Connection, PC COM Port, and iSIC Address) settings that correspond to the data logger and communication method being used. For direct connect data loggers, make sure the baud rate is 9,600, no parity, 8 data bits, and 1 stop bit. 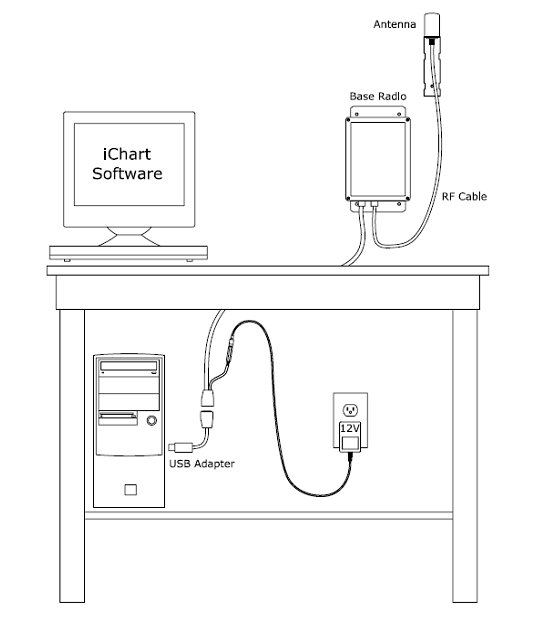 For radio data loggers, make sure the PC COM Port that the base radio station is connected to is selected. For cellular data loggers, enter the IP address of the cellular modem and make sure that the IP Port is set to 500. 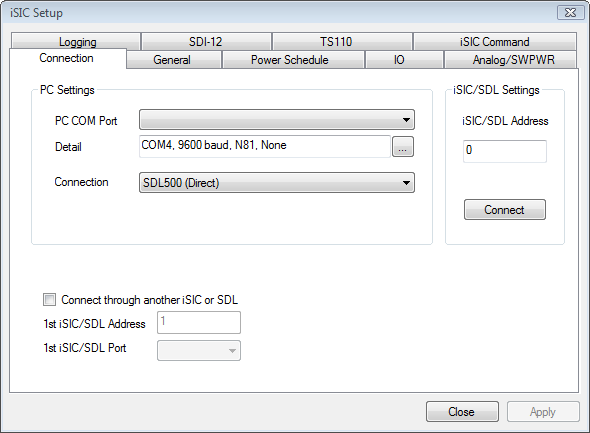 Note that the default address for a single SDL500 is “1”. Address “0” is used as a broadcast address and will attempt to connect to any data logger on the COM port. Once the communication settings have been input, click Connect. Navigate to the General tab. The SDL500 will send its current status (time, operating battery voltage, real-time clock battery voltage, firmware version, hardware version and ID) to iChart. If this information is displayed, communication has been established.